What kind of city of the future do we want to live in? Last year I went on a mission to find what makes a city great. Or liveable. Vienna where I live is ranked highly in the various lists a of the world’s most liveable cities. In 2017 it came first again ( 8 years in a row) on the Mercer quality of living ranking. But ranking does not always equal happiness, and there were two cities I wanted to explore which don’t have high rankings. Reykjavik in Iceland and Singapore (the city takes up the whole country more or less) could not be more different, They rank only place 37th and 26th respectively in the Mercer ranking, but having talked to natives, was convinced that each had some lesson to tell in the challenges of city (non-)planning and how different perceptions of quality of life can be. Iceland is a country where nearly everybody claims proudly to be related by DNA to the world cup nearly-winning national football team. It is a country where there is a small waiting list for the jail (it is tiny, and they have a low crime rate), and where building in the horizontal is still the norm. Why build vertically when you are the most sparsely populated country in Europe (3.2 people per square km compared to Germany with 227 per sq km). With a total population of 350,000 and the capital with125,000, Iceland is rumoured to have two times more sheep than inhabitants. Compare that to Singapore with 5.6 million and nearly 8000 per square km. And no sheep. If you want space, sky, and quality of life then move to Iceland. If that is you can overlook the fact that it is very very light for 6 months of the year and very very dark for the other 6 months of the year. And that when you see the vast brutal emptiness and force of the volcanic landscape, you understand why some of the most gruesome crime stories are filmed here. Paradoxically there is little crime and the murder rate is one of the lowest in the world. However, when it comes to building there is little diversity or cutting-edge architecture. 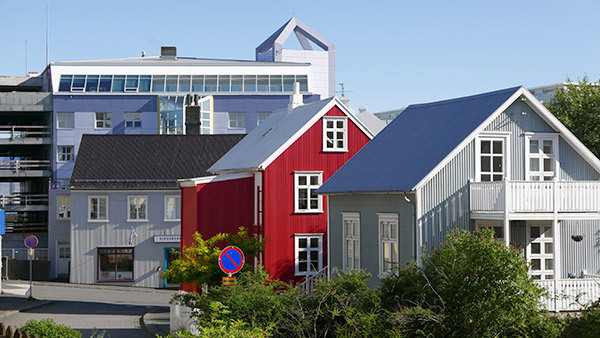 One of the oldest buildings in Reykjavik is still standing – a little blackened wooden hut more or less. They don’t build much with wood – partly because there is little or no wood to boast of (“forest” is we discovered a relative term). Indeed, there are so few trees in Iceland that they have a “Tree of the Year” contest. On our superb tour of the main city our guide called Thor (what else!) proudly went out of his way to show us the 2016 Tree of the Year in Reykjavik with its special plaque. Blink and we would have missed it. The 2017 tree of the year was, I was informed, still growing. Many of the buildings in the capital are made of concrete covered with corrugated iron. To make them more interesting and to differentiate them from their neighbours many are painted in jolly colours – adding a kind of tutti fruity ice cream effect. The corrugated iron I was informed, is not for decoration but protects the concrete from the ravages of the salty air and winds. The other competitive element is the excellent graffiti murals on the side of many of the larger buildings – revealing a thriving artistic street scene. A month later I was in Singapore where there is no landscape to speak of. There is however an impressive cityscape. Statement high rise buildings dominate the central skyline – rarely giving a sense of what purpose they may have. In the center of the city are the show-off architectural pieces – saying more about money than style. However central areas around the river with long open walkways are designed to be welcoming safe public spaces – not unheard of for women to walk or run late at night there alone. Meanwhile travelling out towards the edges of the city there are areas with rows and rows of unimaginative and dull public housing high rise blocks – so many that they do not have names but numbers. It reminded me immediately of Karl-Marx-Allee, the monumental socialist boulevard in Berlin, though my guide was shocked at the comparison of this sought-after Singapore city housing to a collection of communist blocks. Around 82% of the population live in such developments with little green space, and no shared spaces to speak of (co-housing does not appear to be a theme). 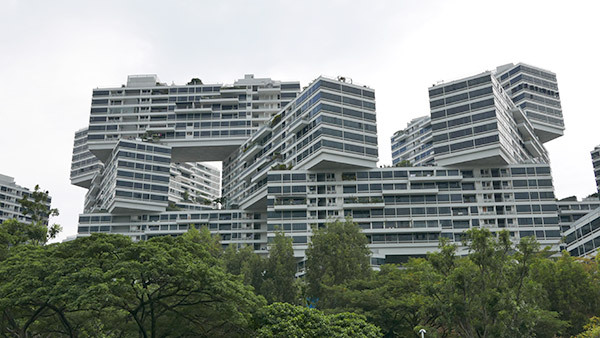 In terms of architecturally significant private housing developments, one of the most interesting is the Interlace – a series of 31 blocks with 1000 units. It is a huge gated community, with shared spaces and facilities, and a private bus to transfer the inhabitants to the center of town. 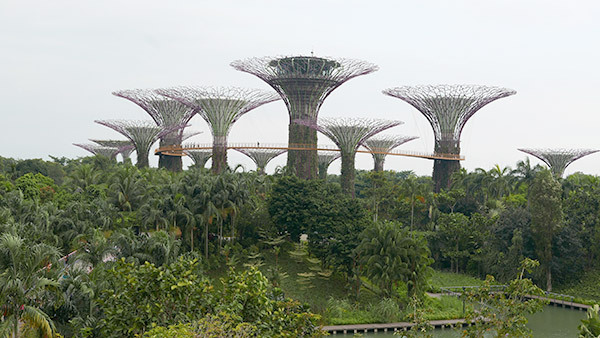 One of the large flagship public spaces is »The Gardens« at the Bay development and that gives the impression that there is a strong ecological bent to the city development. The large solar powered water collectors that look like large upended trumpets seem to be a popular background for wedding photos, and are a symbolic attempt to change the city image. When it comes to ecology and transport, I did not see any evidence of electric cars nor charging points. When it comes to mobility »The Rapid« public transit system does not live up to its name according to the locals, as it frequently breaks down. However, there are so-called smart cards for older (and slower) citizens that allow them to tap a panel by the traffic lights to give them more time to cross the road. I asked what Singaporeans do in their free time. Where do they go if there are few public green spaces and if they can’t afford to fly to Indonesia for the weekend like many of the ex-pats. Apparently Singapore leisure time revolves around eating and shopping in air-conditioned malls. Nothing against shopping and eating in general, but the lack of congenial public outdoor spaces combined with the sun and the temperature, means many prefer to stay indoors in the malls. So bizarrely, like the Icelanders, they don’t appear to see much of the sun the year round either!